Below you will find the 7 Screening tests of the Functional Movement Screen. There are some side notes before each and the correctives for each one will be linked to once I shoot them. 1 per month measuring of physiocal and mental development. The deep squat is one of our most primal movement patterns. The others are lunging, twisting, bending, throwing, kicking, and gait. If you watch a baby stand up, they have perfect squatting form. But as we grow up we don’t use the pattern like we should. If you don’t use it you will lose it. And that is what the squat is for. Please understand if your coach thinks that achievement of the deep squat cannot be reached a simple toe touch will be used instead. The deep squat with arms overhead is a fully coordinated movement, demonstrating total body mechanics and neuromuscular control when performed properly. We use it to test bilateral, symmetrical, functional mobility and stability of the hips, knees, and ankles. The dowel rod overhead helps to test symmetrical mobility and stability of the shoulders, scapular region and thoracic spine. This screen will help expose any compensation or asymmetry in your stepping ability. This movement requires proper coordination and stability of the hips, moving one at a time, while the core and pelvis must maintain alignment and stability themselves. We want to avoid any excessive upper body movement while using a basic stepping pattern. This looks like a simple test but looks are deceiving and this is 2nd in line with our correctives behind shoulder mobility. This test identifies active mobility of the lifted leg while keeping continuous core stability and the available hip extension limit of the down leg. Basically it is testing the ability to separate the two legs in an unloaded position. It also is challenging your hamstring and gastric-soleus (calves) flexibility while maintaining a stable pelvis. This screen is observing your ability to stabilize weight shifting and coordination efforts of your mobility and stability in a basic climbing pattern. 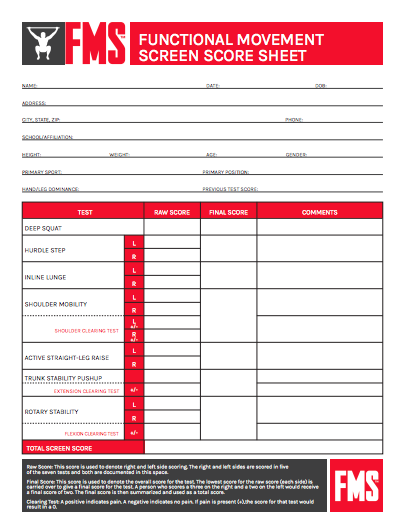 The HP scoring sheet is designed to track and record the results of the functional movement screening. The goal is to score 21 points anything lower would demonstrate dysfunction movement and lacking of rotational or lateral stability which greatly diminishes athletic ability. Raw Score: This score is used to denote right and left side scoring. The right and left sides are scored in five of the seven tests and both are documented in this space. Final Score: This score is used to denote the overall score for the test. The lowest score for the raw score (each side) is carried over to give a final score for the test. Score To The Lesser: Scores a three on the right and a two on the left would receive a final score of two. The final score is then summarized and used as a total score.